WAILUKU  Major broadcasters in Hawaii are renewing efforts to establish a site for television antennas in a wilderness area of Haleakala. Opponents say the antennas at Kalepeamoa would make a cluttered ridge top out of a sacred area known for its scenery, and that the antennas would intrude in the migration and nesting area of the endangered Hawaiian dark-rumped petrel, or ua'u. The Hawaii Television Broadcasters Association will be meeting next Wednesday with at least two organizations that have expressed opposition to the proposal: Friends of Haleakala and Hui Ai Pahoku. Association President Michael Rosenberg said broadcasters expressing a serious interest in establishing the site are KGMB, KHNL, KITV, KHON, KHET and KFVE. Rosenberg, general manager of KITV, said the intent of the meeting is to fully understand the opposition's side of the story. "Hopefully, we can figure how to make things work at that location," he said. Opponents of the antennas say they would intrude in the migration and nesting area of the endangered Hawaiian dark-rumped petrel, or ua'u, above. Broadcasters have been looking for an alternative site for more than eight years as their increasing presence on state land on the mountaintop interferes with work by the nearby space observatory. Transmission interference would more than double at the site if TV stations begin sending digital, as well as analog, signals by May 2002, as required by the Federal Communications Commission. "It's really a problem because of proximity," Rosenberg said. Rosenberg said sites other than Kalepeamoa have been examined by engineers and found to be less suitable, either because they do not solve the problem of interference with the observatory or they lack the altitude needed to reach many TV viewers. "We've looked at every possible site, and this seems to be the site," Rosenberg said. 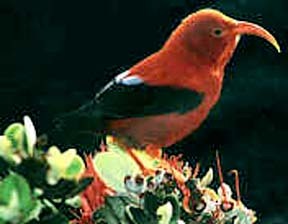 Charles Maxwell, the spokesman for Hui Ai Pohaku, said his group continues to oppose locating antennas at Kalepeamoa, saying they would ruin the spiritual essence of Haleakala. He said the area was part of a 1790 eruption and is part of the path of Pele, the Hawaiian volcano goddess. "The whole area is steeped with legends and spiritual things," Maxwell said. Mary Evanson, vice president of Friends of Haleakala, said her group fears putting antennas at Kalepeamoa will be the beginning of development in the area. "We just feel that area needs to be left alone," she said. Rosenberg said while some people might say TV viewers can connect to cable to receive transmissions, many still rely upon TV broadcasts over the airwaves for news during emergencies, such as flash-flood warnings. "The bottom line is, we have to find a transmission site that works for us. We do have a public trust to spread our signal throughout the entire state," he said. "I think we're really going to have to make concessions to make this thing work."